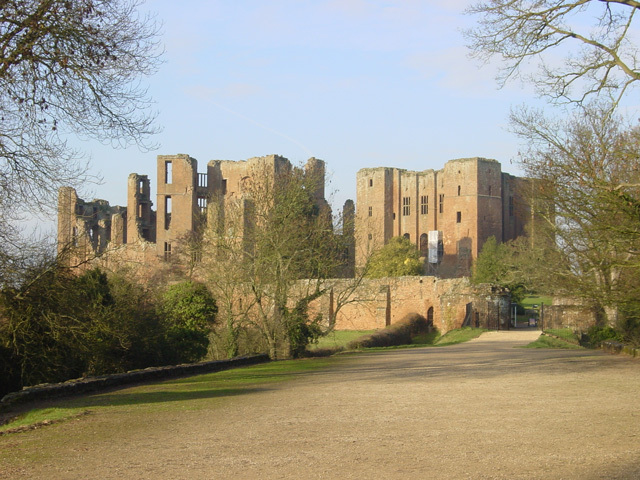 Notes: Kenilworth Castle is located in the town of the same name in Warwickshire, England. Constructed from Norman through to Tudor times, the castle has been described by architectural historian Anthony Emery as "the finest surviving example of a semi-royal palace of the later middle ages, significant for its scale, form and quality of workmanship". Kenilworth has also played an important historical role. The castle was the subject of the six-month-long Siege of Kenilworth in 1266, believed to be the longest siege in English history, and formed a base for Lancastrian operations in the Wars of the Roses. Kenilworth was also the scene of the removal of Edward II from the English throne, the French insult to Henry V in 1414 (said by John Strecche to have encouraged the Agincourt campaign), and the Earl of Leicester's lavish reception of Elizabeth I in 1575. The castle was built over several centuries. Founded in the 1120s around a powerful Norman great tower, the castle was significantly enlarged by King John at the beginning of the 13th century. Huge water defences were created by damming the local streams and the resulting fortifications proved able to withstand assaults by land and water in 1266. John of Gaunt spent lavishly in the late 14th century, turning the medieval castle into a palace fortress designed in the latest perpendicular style. The Earl of Leicester then expanded the castle once again, constructing new Tudor buildings and exploiting the medieval heritage of Kenilworth to produce a fashionable Renaissance palace. Kenilworth was partly destroyed by Parliamentary forces in 1649 to prevent it being used as a military stronghold. Ruined, only two of its buildings remain habitable today. The castle became a tourist destination from the 18th century onwards, becoming famous in the Victorian period following the publishing of Sir Walter Scott's novel Kenilworth in 1826. English Heritage has managed the castle since 1984. The castle is classed as a Grade I listed building and as a Scheduled Monument, and is open to the public.